The Music Room opens out onto the rippling sound of running water, twittering birds and the beautiful Rose Garden with its ‘Maiden and the Rose’ fountain statue at its center. 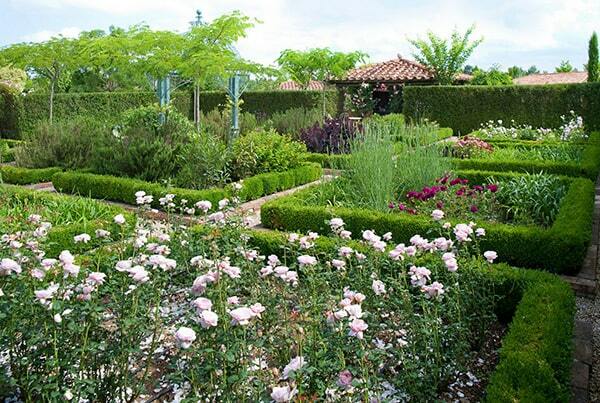 The roses in this garden have been carefully selected to ensure a continued renewal of blooms throughout the spring, summer and autumn as well as for their delicious scents and variety of color. The the delicate scent of roses continues down the Pilgrim’s path or rose pergola which stretches across the heart of the Borgo Santo Pietro estate with its various species of climbing and rambling roses. Step off the path and you could encounter our in-house florist who will enchant you with a stroll through the Flower Garden to gather seasonal blooms before returning to her cottage where she lovingly shares her art of flower-arranging. Not far away, the sweet-scented Lemon Garden offers privacy - it is a place of great peace and tranquility where you can curl up on a sun lounge, close your eyes and let your senses take over.